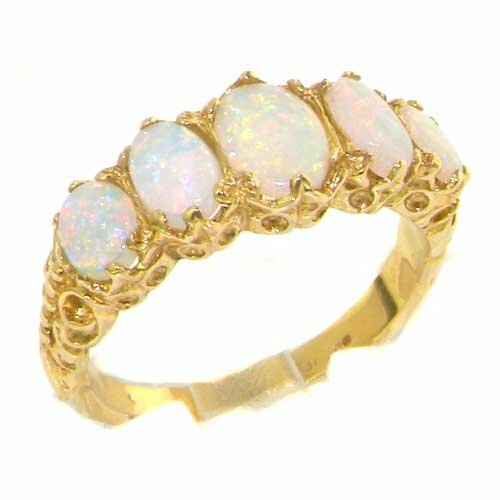 10k Yellow Gold Natural Opal Womens Band Ring - Sizes 4 to 12 Available | What Should I Say? This is a most beautiful set of Magnificent and Fiery Opals, all oval cut sizes 7x5mm (0.28"x 0.20") two 6x4mm (0.24"x0.16") and two 5x4mm (0.20"x0.16"), all set in a delightful Antique style setting made completely from 10K Yellow Gold. This is such a wondrous ring to wear, you will be enchanted. The Opals are certainly large enough to be noticed, however the design of the ring makes it a very easy and comfortable piece to wear. These Stunning Opals also look Fabulous set against the highly polished Yellow Gold -- you will want to take the ring off and show it to your friends so they can fully appreciate the quality of this piece. Completely made from Solid English 10K Gold Hallmarked by the Dublin Assay Office, which confirms the ring's authenticity. The Hallmark includes the .417 marking plus the symbol for the Dublin Assay Office. . If you have any questions about this product by LetsBuyGold, contact us by completing and submitting the form below. If you are looking for a specif part number, please include it with your message. Noray Designs 14K Rose Gold (0.06 Ct, G-H, SI2-I1 Clarity) Stackable Ring. Available in sizes 4 to 9.